“Always strive to learn what to do to prevent or minimize risk,” says Greg Payne, our latest Safety Hero. “Keep safety as a forethought on everything you do. Think proactively, find any hazard, mitigate the hazard, and repeat,” he adds. 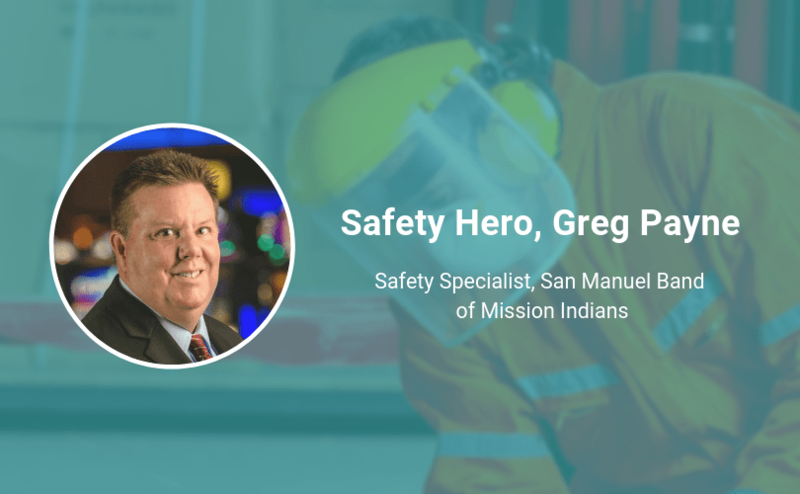 Greg is a Safety Specialist with the San Manuel Band of Mission Indians, a federally recognized tribe that is located in San Bernardino County, California. Greg wasn’t always in the specific safety role he’s in now—in fact it took a life-changing incident for him to change his career path. Keep reading his story to learn what he says is important to be effective in safety, and what his advice is for those starting out in in the field. I was in a serious motorcycle accident that changed my life forever. It was a near-death experience that made me re-analyze my life, and this lead me to a new career as a Safety Specialist working to minimize risk to life both personally and professionally. Were you always in safety? No, I was in law enforcement prior. Communicating, coaching and mentoring. Family, friends, coworkers and the community which I live and work. It is easy to be overwhelmed with all the safety codes and regulations. But, find the topic or issue you know nothing about and learn. Take how to use a fire extinguisher for example. Learn everything you can about fires, extinguishers, and prevention until you master the subject. One step at a time, you will soon be a well-seasoned safety professional ready to share your new learned knowledge with others. The scary part is you will also see safety hazards everywhere in your daily life, that you wouldn’t have seen before. For example: does your favorite restaurant have fire extinguishers? Have they been inspected and are they current? Do the employees know how and when to use it? An accident or emergency can happen anywhere at any time. Always strive to learn what to do to prevent or minimize risk. Stay safe! Keep safety as a forethought on everything you do. Think proactively, find any hazard, mitigate the hazard, and repeat. My self-identified superpower is coaching others. For example, teaching employees how to safely operate dangerous equipment like aerial lifts, forklifts, and chainsaws. In the real world, there are very real heroes walking among us – often going unrecognized. These are our Safety Heroes. If you know someone who should be nominated, let us know today.